of unidentified bears, stuffed animals and vintage toys. Ken did this for years and was an expert appraiser. I was his understudy or apprentice and together we viewed and enjoyed each and every request that came our way. Appraising bears online will be a fun adventure for all of us. We will share our discoveries here on this web page. Meeting new faces, in teddy bear form, and sharing the knowledge I have gathered, will be a joy. Together we can discover that everything old can be newly appreciated! How much is your beloved bear worth? Cursor down to discover the appraisal procedure. I found this bear at my parents home. It belonged to my father and he had shown it to me several times. It’s been in storage approximately 70+ years. As best I can guess. I know very little about it. My father passed away in 2002. 2 years ago we cleaned out my mother’s home and found it. She’s been moved to assisted living. The bear is 10 inches long has jointed arms and leg. It does have a working squeaker. As best I can tell it is Mohair and has glass eyes. It also appears to be filled with the excelsior. I’m wondering what it’s worth. It is wonderful that he was preserved all these years! He is an American bear, from the Aetna Toy Animal Co., formerly called Keystone Bear. They produced bears during the early years, forming in 1907. They were only sold through the George Borgfeldt & Co, wholesalers. Their quality was excellent, with the finest mohair, wool felt pads (cardboard under the felt for standing), amber glass eyes, long arms, and a voice box. The hand closed seam is in the back of the body, while the vertical woven nose with cord is in very good condition. An extension for the inverted Y mouth is missing, but we can see the remnant yarn. The ears are somewhat to the side of the head, dating him to around 1908. The stuffing is excelsior. Originally teddy bears were made for boys, since girls had dolls. The association to Theodore Roosevelt also trended towards appealing to boys. However, the girls adopted their “New Love”, by Bessie Pease Gutmam, with the painting of a teddy being clutched by a little girl while her doll was sitting alone, The firm became known as Aetna Doll and Toy Co., then in 1919, E.I. Horseman purchased the company. If you had pictures of your Dad with teddy, that would add provenance. Value for the 10” Aetna would be $750.00. 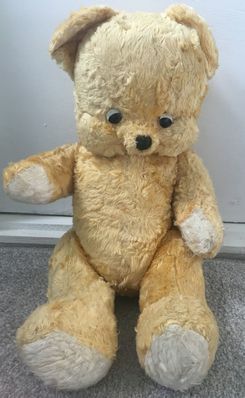 I have rescued this Teddy Bear from my Mum and Dad’s attic, it was on the way to the dump! The Teddy Bear’s height is around 45cm (18"). The head, arms and legs are jointed. We are not sure where the Teddy Bear has come from and do not know much about him! Hope you can shed some light on him and his chubby cheeks! I had to smile when I saw your “Cheeky” teddy bear! I will enclose a picture of his cousin, as shown in the Linda Mullins Teddy Bears Past and Present, written in 1986. Within this book he is labeled as from 1930, and an unidentified maker. Many since have called these Dutch bears, with the large head, full cheeks and tin painted eyes. 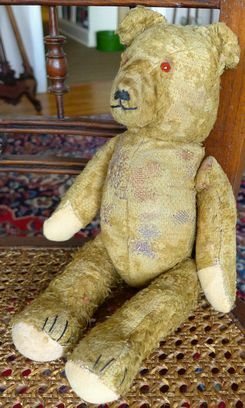 Arthur Van Gelden made bears from synthetic silk plush, firmly stuffed with excelsior, and five way jointed. The arms are short, and set high on the shoulder, while the legs are chubby and have slightly formed feet. Both pads on the limbs are contrasting silk plush with no claws. He has a finishing seam in the center back body. The tin eyes resemble the Berryman bear eyes, with the googly look. The left button eye seems original, the right has been repainted. He has a sweet smile, probably so happy to have those chipmunk cheeks! The nose and mouth are black cord. He dates to the 1930s, as this company was short lived and WWII, stopped production. Value for your 18” attic find is $150.00. He is 26" tall and is jointed at the head, arms, and legs. I believe his fur is mohair, with felt pads? His body is pretty firm and "crunchy," and I can see the filling on the right paw. His eyes are glass and amber in color. His nose is some kind of yarn. He does not have any labeling that I can see. Let me know if there is any other information I can provide. What a sweetheart, I like your taste! Your teddy bear is American, and dates to 1915-16. With this large size, not many were made in this category. The fur is mohair, with a wool cord hand sewn nose and inverted Y mouth. He has shorter arms than those made a decade earlier, but substantial enough to correspond to the football shaped body. There is no definition on the wrist area, which is a very American trait for this period. The legs are long and formed with a noticeable upward foot; however, this is slight compared to some German models. The front body seam is machine sewn, while the seam in the back is a hand sewn closure. The stuffing is excelsior, which allows him to retain his shape. There is wear to the wool felt pads, common for the American bears with a lesser quality felt. The eyes are glass, and may be replacements. He would have had a more amber colored eye with a black pupil. The ears are somewhat cupped, and the shoulders are placed high on the body. According to ads from this period, possibly Bella’s Hess & Co. catalog features a 24” bear, or Holland’s Magazine from Dallas TX, posts premium toys and offers them for earnings. For many years, these have been accepted as similar to Ideal Novelty and Toy Co. There is little notice of a hump on the back. Value for your large bear would be $800.00. Here is the bear I would like you to look at. Top of head to feet 16”. Has strange almost triangle ears with the point in his head the ears don’t seem round on top but straight across. His fur seems like there are different color tones. Might be the light. When you squish his head it makes a crunch sound but you have to listen very close. Seems firm everywhere He was bought after 1939 up until 1944. The head can swivel side to side. Looks like there is a lot of hand stitching. I don’t know if the ribbon is original or not. Your non jointed teddy with the jointed head should have been referred to as a crib bear. The disc joints were hard and cumbersome, so leaving them out meant for a “softer” bear. With the over stitched seams on the muzzle and seams, it most probably is a Gund bear, American manufacturer. The large glass eyes and large smile make him very appealing. The muzzle is a shorter mohair, while the body has a longer nap. The nose cord is done in a vertical stitch, with no claws or pads. Your time line for purchase points to the war efforts and scarcity of materials. 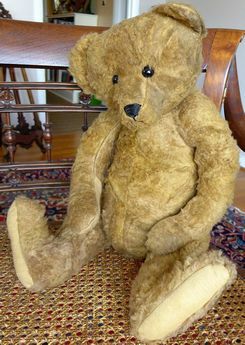 At the time, Teddy Gund was introduced in 1948, but had jointed arms and legs. Cubbi Gund was unjointed and premiered in the 1950s. Most of these were plush teddies. At 16”, he is still considered medium sized. 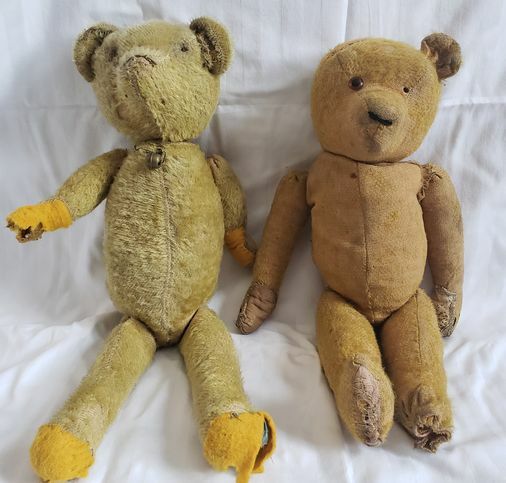 I recently found these two bears at an antique shop and am very interested in learning more about them. Both are between 17 3/4" -18" in height, stuffed with wood wool, disk jointed, and covered in mohair. Both also have small humps towards the top of their backs and hand-stitched noses. The first is missing both eyes, and has one paw ripped open. All pads look to have been originally made of blue fabric, but later covered with yellow felt. There is also a small bell stitched onto its neck. The second bear has a hole in one shoulder, is missing an ear, the stuffing from one foot, and one eye. The other eye is amber and black colored glass. There are also hand stitched claws on two of the feet. Most of the hair has fallen off both, and they are in less than ideal condition, with no tags to identify a brand. Any information you have about them would be greatly appreciated. Your bears are very well loved! The one on the left, is American- attributed to Ideal Novelty and Toy Co. with the stick like arms and legs, and football shaped body. He had glass eyes, amber with black pupils, a horizontal cord nose and had a mouth extension with the inverted V. We can still see the downward stitches in place. He dates to the 1920s with the shorter arms and a football shaped body. The pads are are replaced. Looks like he has some missing excelsior on the right paw. The metal bell was an add on, maybe his voice box was not working. Not sure if the blue fabric was original, most had a tan felt covering. Value would be $125.00. The bear to the right is German, and with the sliced in ears, most likely Petz. He seems to be winking with the left eye missing! The eye remaining is glass, a brownish red iris and black pupil. The nose is cord and sewn in the horizontal fashion. His arms are longer, and his right foot has a formed ankle. The left side could probably use excelsior in this area to reform his foot, ankle and pad restored. He dates to 1915, has claws and a wide neck joint. As is, he would be known as primitive and valued at $75.00. Restoring could increase the value. The mouth extension was a small inverted V.
I’m looking for some help with a bear my grandmother has had for year and years. It has been well preserved and she told me that it is Steiff bear. I believe she acquired it at an auction 50+ years ago. 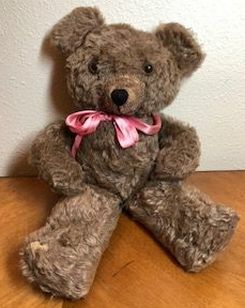 She was meticulously storing this little bear and she was an extensive antique collector, so I’ve always assumed that she was correct, that it is indeed a Steiff bear. 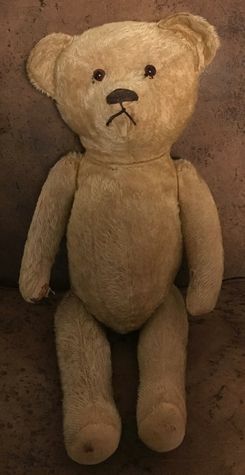 After doing some research, it appears to be an authentic bear, missing the tags, but may have a small hole in the ear where there was a tag and a string is still attached coming from the arm – but not sure if that was an original tag. There are no tags or identifiers that I can find. He is in really good shape. 15" tall, is five way jointed and appears to be mohair. I believe he has excelsior stuffing because it sounds crunchy when squeezed. His body is quite firm and feels like there may be something hard in his belly. I hear something moving around inside of him when shaken;- maybe a broken growler? My husband is going to take him to work to be x-rayed. He has 3 claws sewn in each paw. There seems to be a small divot on the back of his head near his neck, but it's not a hole in the fabric. Thank you very much! This is my much played with and very beloved teddy named Honey. I believe he was given to me by my grandmother, Winnie Struve Taylor, when I was born in 1940. He has been packed away for about 60 years. I unpacked him recently. His sweet face and worn fur stirred memories of the joyful hours I spent playing with him. I now wish to know his history as eventually he will be passed on to my daughter and then to my granddaughter. He is fully articulated. a growler inside that I do not recall working. His stuffing appears to be kapok and excelsior. He has no evidence of ever having a tag and no stitched claws. 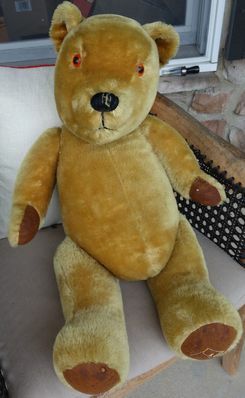 This guy or guys, I have 2 of the same bear but one is 1” shorter than the other, is 18” long (17”) Yellow/Golden Mohair, Disc jointed, appears to be some kind of velvet or vinyl type paw pad covering, 18” has plastic eyes I think, 17” has glass ( I just discovered that), nose is something weird plastic?, floss mouth, big squeakers, straw stuffing (see boo-boo picture) the 17” is much nicer overall. The color is more true in the first picture. Thanks! This one has beautiful chocolate mohair, 19” from head to toe, huge ears kind of wide set, plastic eyes not sure if they are original they kind of stick out a little too much, disc jointed, shaved muzzle sort of squashed, excelsior and something non-cracklely stuffing, Giant box inside (see last picture) takes up most of his back. He weighs over 2 lbs. Brenda meet Osteo an 11” Osteoporosis patient, serious humpback. Close set shoe button eyes, straw or excelsior stuffing, pigeon toed, out turned front legs, nice golden mohair. Your “doll sized” teddy at 11”, is a replica of an early Ideal American bear. He was created by a skilled teddy bear artist, possibly from the USA. The 1980s began the reproduction era in the bear world, with Steiff leading the way on their museum replicas. They still continue with older styles adapted to today’s market, while also designing new models. This encouraged artists who wanted to recreate the old look in teddy bears, to make their own mark. Now, back to your teddy. The serious humpback was exaggerated to simulate an older slouchy bear. The black cord nose is sewn in a horizontal fashion with the outer stitch finishing, and has a small mouth. His ears are somewhat flat, with the head seams revealing mohair still tucked in the seams. Condition is pristine. The eyes are flatter than shoe buttons, and a bit larger. They are glass, and were sewn inside the head seams, just like early Ideals. His wool felt pads are also mint. The long arms were styled in the early tradition, with no claws on the paws. Artists also used excelsior, and he was hand closed in the back. With aging, most older bears have ankles that turn the feet outward. I feel like I’m going to get turned in to CPS for bear abuse. I think this guy is really old, but you’re the expert. 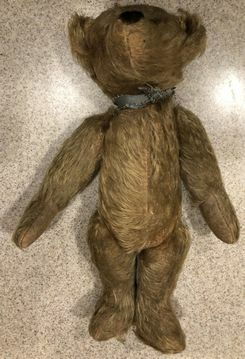 Here’s the details: 14” light brown mohair, Red glass eyes (no even evil looking), replaced paw pads, floss nose and claws, a squeaker or growler inside not functional, and he is straw stuffed. 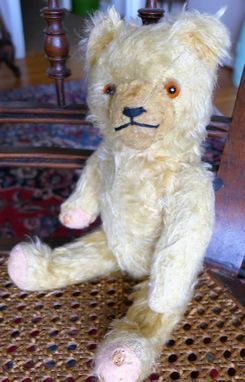 This yellow mohair bear is disc jointed, straw stuffed, floss nose and claws, and orange glass eyes. This poor guy is 20” long from head to toe and has been well loved missing lots of mohair and his ear! Perhaps he was an artist and loved Van Gogh? Your large well loved teddy has such a sweet face! 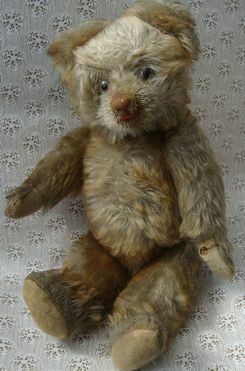 He is an older bear, dating to around 1920, and is German. The founder was Alwin Kiesewetter, who formed a toy factory in 1907. They exported dolls, toys and teddy bears with a trademark, AlkiCo established in 1921. The Coburg location was home to many other manufacturers. Five way jointed, Amber glass eyes, and low shoulders contribute to his heritage. The pads were recovered some time ago, in a cotton twill fabric. His original black cord nose is done in a horizontal stitch, with the inverted Y mouth extension. He also has what appears to be 4 black cord claws sewn on both hands and feet. Stuffed with excelsior, the missing ear reveals this product. Another ear could be made, however, simply closing the open seam may be an easier mend. He could sport a little beanie hat (preferably black ), to confirm your Van Gogh story! At 20”, this is a large sized bear! Value for his originality would be $ 250.00. 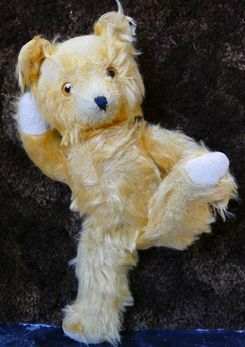 This is the last one (maybe) it is a 12” golden mohair bear, disc jointed, amber eyes, floss nose, straw stuffing and in picture 6 you can see the squeaker sticking up, it does not work. As stated on the first bear they all came from one elderly lady’s estate. I do believe she was German there were German clothing items with the bears and candy wrappers in the pockets from old German candies. similar nose stitching to smaller Steiff bears, horizontal cord with an outer outline stitch. 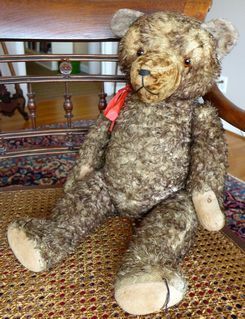 Most Steiff bears over 16” have a vertical completed cord nose. That is the only similarity to Steiff though. The very long hands with pads, correspond to the large feet, with no claws evident. The stuffing is not hard, so it must be the cotton filling you are referring to. Early bears had excelsior, while later bears were kapok or poly filled. The center front seam in the body is a hand sewn closing seam. The side view reveals a very large almost exaggerated hump, corresponding to the large arms and feet. We can also see the lightly stuffed tummy, a bit slouched. At 25” this would be very heavy if it was old. I think the artist was quite skilled, with good sewing techniques. They used a vintage styled wool fabric that needs a light cleaning. The eyes are shiny black glass buttons, and the ears are flat. A great bear for display, with a value of $150.00. a tiny hole in his left ear (see 2nd picture) disc jointed, long snout, straw stuffing, glass eyes, floss nose and claws, tipped looking mohair, no hump to speak of, 3lbs. I believe she was German. Anyway this one is mohair and it has not been cleaned as of yet but I do intend to do so as per your instructions. I was not sure because of the fluffiness so I pulled a bit off and burned it and it produced ash. He is 25” tall and weighs 3 bs. Center stitched chest, stuffed with some sort of dense cotton? packed very firm. Long snout, embroidery nose, shoe button eyes, hump back, jointed. No marking anywhere. and one of the front paws has a hole in it which reveals the stuffing. When I squeeze the body, the stuffing sounds crackly. Excelsior? The eyes might be plastic or glass, but not sure. the stitching has loosened about 3/4" long. 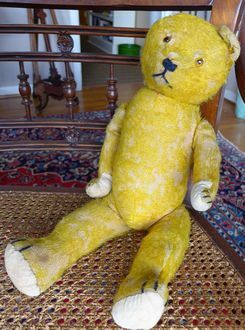 Your Mom had a very discerning eye to purchase this teddy about 30 years ago! 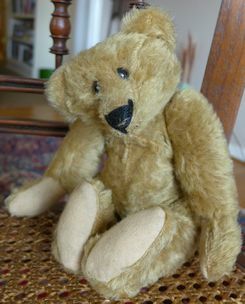 He comes from Germany, and is an Edward Cramer bear with the characteristic embroidered mouth and smile. 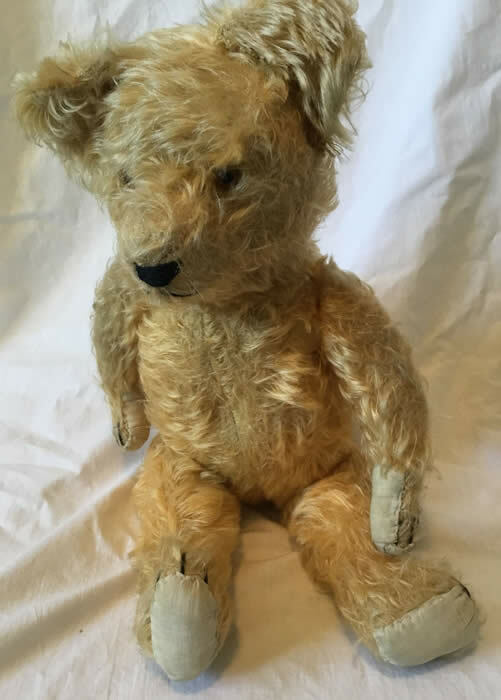 The heart shaped muzzle face (mohair is shorter too), vertical stitched cord nose, glass eyes ( that had painted backs like Steiff and Schuco) which were sewn into place on the wire looped shanks and long bicolor mohair make this an exceptional teddy from the 1930s. Cramer’s are harder to find and somewhat rare. The factory of plush toys was formed in 1885..and remained in the family until 1952. From what we learned in the 1990s, a direct descendant resurrected the company, and it is in family hands again. Educa was the trademark when your Teddy was made. Excelsior is the stuffing, and the circular disc was a squeaker or growler. They also made musical bears with a squeeze box mechanism. Your 13” bear would be valued at $1,200.00. Enjoy your keepsake! and she has had since childhood. She believed it dated to the 1940s, but I can't confirm that. The bear has no tags or markings of any kind. I hope that you can give me some information about the bear and its current value. All limbs are fully articulate and in working order in that they are firm to rotate . Bear seems to be in a more relaxed state when sitting. The bear may have been purchased in the United Kingdom. Great teddy from the US...and still has his original ID tag! 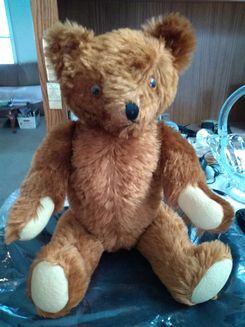 This is a Gund bear from the late 1940s. Jacob Swedlin, a Russian immigrant, became the new owner in 1925. He worked his way from janitor to pattern making, then design and lastly, right hand man to the owner. Originally founded by another immigrant, Adolf Gund, the firm was founded in 1898 in CT as a toy and novelty business. Mr. Gund was very successful, adding teddy bears to his production in 1906. Fast forward, Mr. Swedlin had his entire family involved in the business, however, today they are manufactured overseas. Your teddy has a silk plush fur, googly eyes, felt pads and is in excellent condition. Five way jointed, the typical over stitch seaming is evident. Usually the ID tag was sewn on the left arm. This trademark of the rabbit ears on the G was granted in 1949. Value today would be $ 225.00. 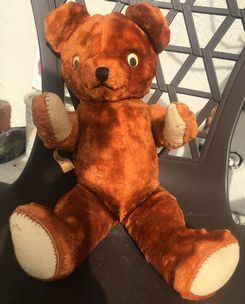 Enjoy your mid century Teddy! This bear was given to my husband about 65-70 years ago. It turned up at an auction of his brother's effects, about 12 years ago, and he hadn't seen it for about 50 years. The bear stand 22" tall and is in excellent condition. My husband believes that two of his older brothers purchased it on a trip to Arizona in the late 40's or early 50's. We are not sure that the holster and neckerchief are original, and there may have been a hat. He remembers it wearing a pink cowboy hat at some point, but doesn't know if that was original. You have a mint example of the cowboy teddy made by the Ideal Novelty and Toy Co. It is un-played with, a remarkable example of the dressed teddies they made in the 1940-50s era. Ideal is known for Smokey Bear, as well as the legend of Morris and Rose Michtom with creating the first American teddy bear. The material is an artificial plush, with a molded resin nose, and felt tongue. Non jointed, he stands quite tall at 22”. 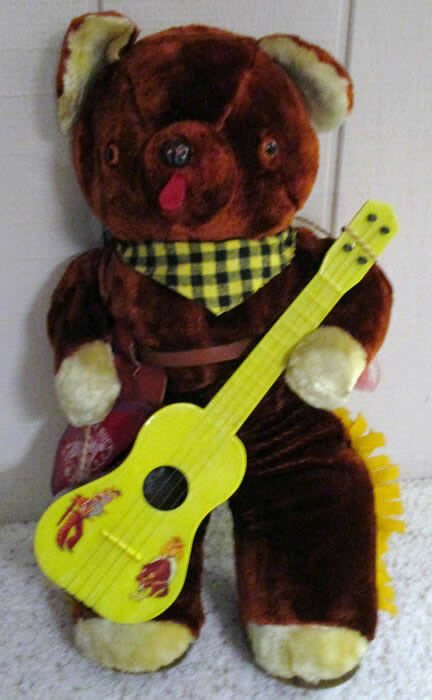 We know that the guitar and holster match the size perfectly, along with the yellow and black bandana. It is hard to find pictures of a duplicate teddy, because most of the time these were interactive toys and enjoyed. Gund did quite a few plush rabbits, all with costumes, and they too had a cowboy as well in the 1930s. The original Smokey came with a plastic ranger hat, which is hard to find today. Perhaps a hat was included at the time, but it seems very complete now, as is. Value would be $125.00 as a mid century toy! 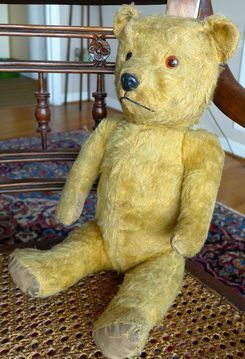 I purchased this Teddy bear at an estate sale and would love to know more about him, he reminds me of Winnie the Pooh. He is large measuring 28 1/2" long he has jointed arms ,legs and head. He's adorable ! His pads appear to be felt. I think his eyes are plastic. On his paw is a partial tag I'm pretty sure its England but, cant figure out the rest. Hope you can inform me on his history. Thanks so much. Wow, nice large sized English teddy! The tag on the left foot is partial, but it was marked, “Merrythought”, Ironbridge Shrops, Made in England. Merrythought goes back to 1919, with a mohair weaving mill that became a toy factory in 1930. They continue to this day, with the direct descendants of the W. G. Holmes family, Sarah and Hannah Holmes, whose father Oliver passed away in 2011. 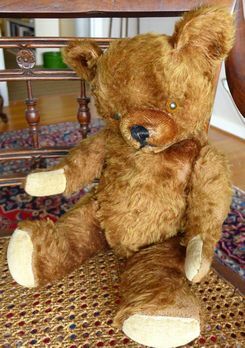 Your teddy dates to the 1960s, with plastic eyes, yet the luxurious mohair exhibited through this company. He is five way jointed, with a heavy cord nose sewn in the vertical position. Winnie the Pooh had English roots with the Farnell Company in 1921. A. A. Milne wrote his first adventure book concerning Winnie the Pooh for his son, and then many other stories followed. It reminds you of Pooh with the large nose, and body. The felt pads have some wear, and reveal the kapok stuffing. The ears have a backward tilt, much like a dog with a gentle disposition. 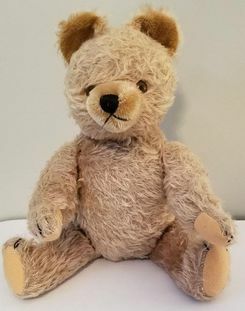 Interesting with the latest emphasis on Pooh Bear in film, Merrythought made a present day Edward Bear along with Steiff, who made all of Pooh’s Hundred Acre friends. 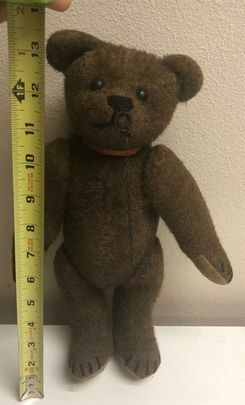 At almost 30”, this teddy today would be valued at $175.00. This 18" bear was given to my mother as a trade in the 1990’s. The lady said it was her grandmother's bear, the lady would have been in her 30’s I’m guessing. It came with Oshkosh Jean overalls on. It is a golden colour, I’m guessing mohair. When I squish it is sounds crackly. The nose, mouth and claws are black thread. In the front body the bear has a concave area that I’m guessing has a growler box (not working). All paws are cloth. Eyes appear to be plastic, Amber colour with black centres. There is no maker mark on it. I would consider it in very good condition for age. The limbs hold a pose well, slightly loose. Your sweet acquisition seems to be from the 1940s with the longer mohair and shorter arm length. I think it points to a German firm, Gustav Forster, formed in 1920. At 18” this is a large sized teddy. With a simple cord horizontal nose, this German maker was one of only a few who offered this trait. The eyes are glass, an amber color with the black pupil center. Most of the time they were merely inserted on the wire shanks, not sewn. This was before the child safety laws. Gustav Forster was located in Neustadt near Coburg, and was a Doll and Bear Factory. Other defining characteristics include the eyes placed outside the head seams, full ears toward the top of the head, and three claws on each paw. The linen pads are hand sewn replacements, over the felt pads. In 1929, they advertised their teddies, and presented a catalog in 1934. They were still operational in 1996. The Oshkosh jeans were an accessory, not made with the bear. At five way jointed, with the excelsior stuffing, the value would be $300.00. Appraisals are $20.00 for each item. and 5-12 photos if possible. Only your first name will be published. Please tell us when you send your photos in your email. 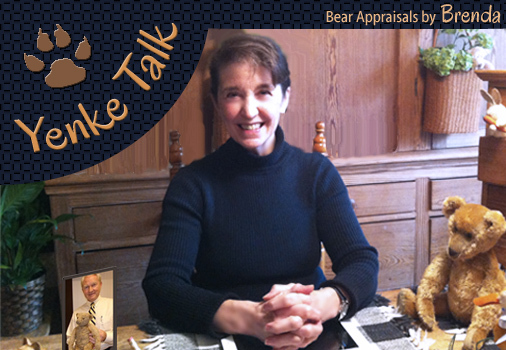 Document contains a photo of your bear, the email request from you describing the bear, and the appraisal by Brenda. 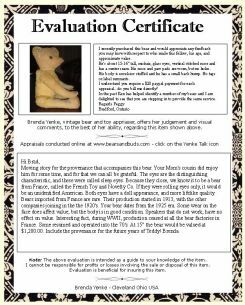 The Evaluation Certificate will come to you in a pdf format for you to print and keep with your beloved bear. Certificates are $10.00 for each bear. Select the option from the PayPal button. 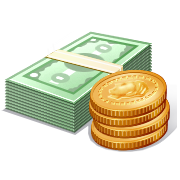 After a paid appraisal, should you wish an Evaluation Certificate, please use this PayPal button for ordering. Please state the name of the bear in the comment box.